The BF loves to visit the liquor store...I guess its like going to Homegoods for me so I just indulge him and tag along. When we were last there to get some New Years eve champagne I came across this bottle of vodka that I loved from the moment I saw it. Seriously? 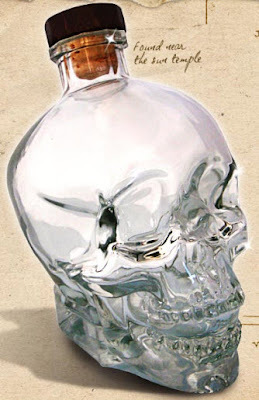 Vodka in a cool skull bottle, talk about pretty packaging! Well I didn't get it at the time, but I stored it in the back of my mind for the next time I had a fun party and wanted an over-the-top bar. 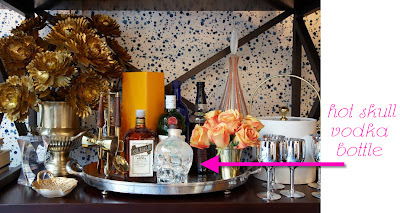 Fast forward to yesterday when I was drooling over all the detailed photos of Eddie Ross's window from the Big Window Challenge and I noticed his little bar set up over on one of the bookcases AND the HOT skull vodka! I'm happy to know he thinks its hot too and I'm sure I'll have no problem convincing the BF that I need to go back to the liquor store ASAP to pick this bottle up. saw it (on apt. therapy) and wondered. very cool bottle. skull and crossbones ( am I) if I drink more than one! Surely, a bottle to die for along with the Eddie Ross Window at Bloomingdales. Now that would be perfect for making Halloween martinis, eh? Good eye! I love the way they styled it. The roses bring a little femininity to such a masculine piece. its cool, but i can't get over those brass flowers!!!!! love it! it would be cool to have a bunch of those lined up for your NEXT Halloween extravaganza!!! I live in Baltimore. Back in October I went to a bar in Federal Hill and Dan Aykroyd was there! He was promoting this vodka because it's his brand. I tried the vodka. It was good, very smooth. I also got to chat with Dan Aykroyd and get a picture with him. It was a pretty cool night. I agree the bottle is tres chic! This is so cool! My brother would love this... it'll make an awesome gift! This is perfect for your halloween party next year! it's really good too!!! thanks for the shout out! That vodka bottle is wicked awesome!